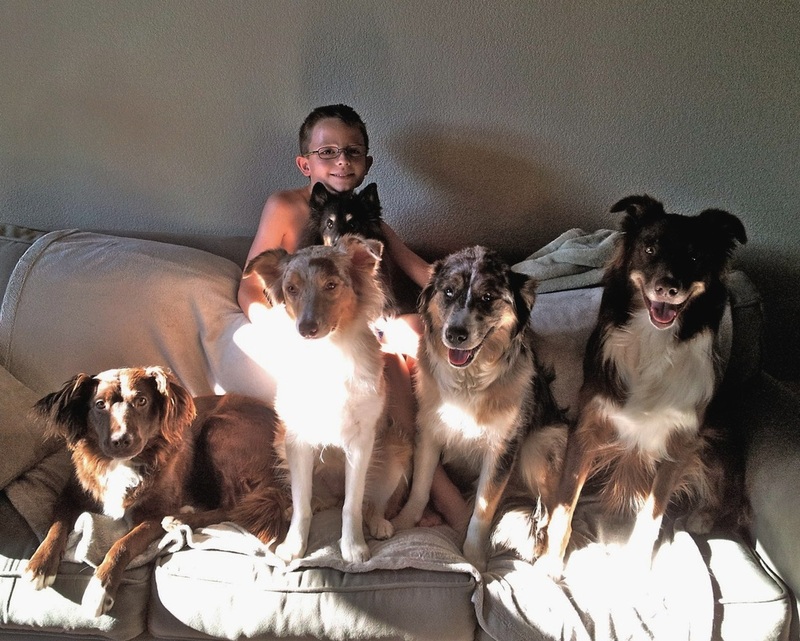 Western Australian Shepherd Rescue rescues dogs from the Midwest, New Mexico, Texas, Colorado, Wyoming, Montana, Idaho, Utah, Washington, pretty much anywhere there is a dog that needs to be rescued. 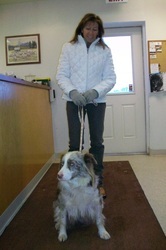 We are usually contacted by shelter workers when a nice Aussie, Aussie mix or herding breed ends up in their shelter. Many of these are kill shelters, but shelter workers work hard to find rescue groups that will take dogs and place them in appropriate homes. Annette has been building relationships all over the country during the almost 20 years that she has been rescueing dogs. We also have individuals that surrender dogs to us for a variety of reasons, typically a dog is surrendered through no fault of his own. We do not have a physical shelter, so where do the dogs go? Good question! Most of the dogs that come into our program go to a foster home to receive the care and attention they may have been previously lacking while waiting for their forever home. Dogs may need a temporary home from a few days to a few months. Where are these foster homes and what kind of person fosters? Kelley, Wade and Sam foster dogs in Westminster, CO. They have Aussies of their own, that compete in agility, obedience and rally. 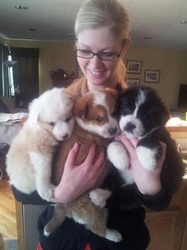 The picture above shows Kelley with 3 of the puppies from one of the litters that they fostered. That is Wade on the floor with Cowboy, a foster that went on to find his forever home. 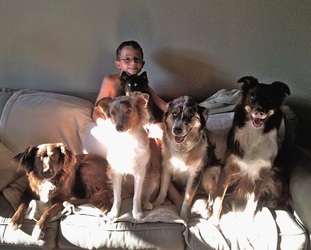 Then there is Sam who helps make sure that the foster dogs feel comfortable with kids. 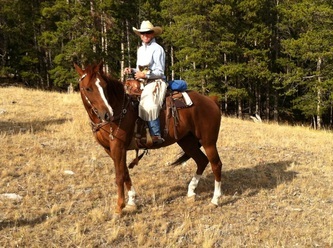 Sharon fosters dogs in Buffalo Wyoming on a large ranch. 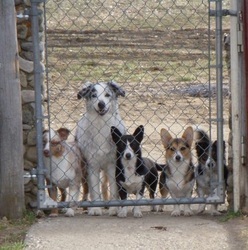 Sharon has Corgis and Aussies of her own that help with ranch work. The fosters at Sharon's house not only get her care and attention they get plenty of exercise and learn about the ranch animals. 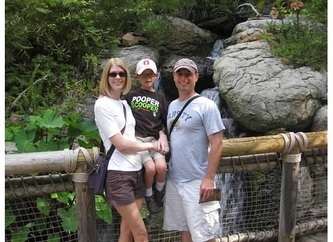 The fosters all get to go trail riding and hiking with Sharon. As Sharon says they all love it. Claudia fosters dogs in Evergreen CO on 13 acres. Her own dogs include Aussies, a Border Collie and a Cattle Dog mix. Claudia's dogs compete in agility, rally and obedience. The fosters at Claudia's house get plenty of socialization with her dogs and lots of practice riding in the truck (in the front of course). The foster dogs get the opportunity to run and play and expend their energy after being in a shelter environment. Claudia's college age sons help with transporting dogs and caring for the fosters when they are home. 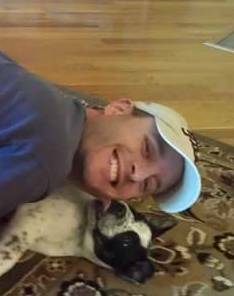 Claudia's husband Bill just smiles when a new dog shows up and gives all the dogs lots of pets. As with most people that foster, the foster dogs just fit right in and get to be part of the family while they wait for their forever home. We are always looking for people willing to share their home with a dog in need. As a foster home we expect that you would take a dog in and include it as a member of your dog family. Being the foster you would help us evaluate the kind of home that the dog would do best in. Some foster dogs stay in a foster home a few days others stay a few weeks and some my wait longer for the right home. If you have any questions about fostering please contact Diane at westernaussierescue@gmail.com New foster families are always nervous to get started, but are amazed at how easily things fall into place. The real reward comes when the foster family realizes that they were part of the big picture of saving a dog and getting that dog to its forever home.